5 How Does a Network Perspective Influence the Management of Invasive Species? Networks of Invasion bridges a conceptual gap between ecological network studies and invasion biology studies. 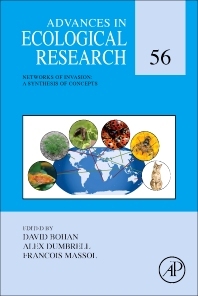 This book contains chapters detailing pressing concerns regarding invasive species in food webs, but also extends the idea of networks of invasion to other systems, such as mutualistic networks or even the human microbiome. Chapters describe the tools, models, and empirical methods adapted for tackling invasions in ecological networks. Dr Alex Dumbrell works at the School of Biological Sciences, University of Essex, UK. François Massol is a researcher at the CNRS in the team “Evolution & Ecology” of the unit “Evolution, Ecology and Paleontology” at the University of Lille. He graduated from the Ecole Polytechnique (2002) and then obtained a PhD in ecology and evolutionary biology at the University of Montpellier (2008). After a post-doc at the University of Texas, he became a permanent researcher at the CNRS in Montpellier (2012) and then Lille (2014). His research covers the study of spatial dynamics of interspecific interactions and of diversification at intra- and inter-specific levels, mostly from a theoretical viewpoint. More generally, he is interested in evolutionary ecology questions pertaining to species interaction networks, spatially structured ecological systems, and the diversity and stability of these systems. He also regularly participates in interdisciplinary projects with researchers from mathematics, computer science, physics and social sciences, in particular on questions related to modeling and statistically analyzing contact and interaction networks.